I'm going to have to stop using PB. Once again, I'm losing "data", or at least in this case, the links. 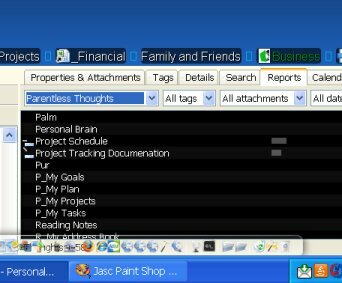 (See post re: Data Loss in Notes under Personal Brain Issues for previous issues with loss of data). If PB is supposed to be my data store for GTD and other information storage, the loss of data is simply unacceptable. Twice in the past month, I've had issues with data loss. So until the product team can PROVE to me that what I put in will stay, it's simply not a viable product. I have a general purpose brain that I use for all of my business and personal GTD stuff (approximately 1200 thoughts). 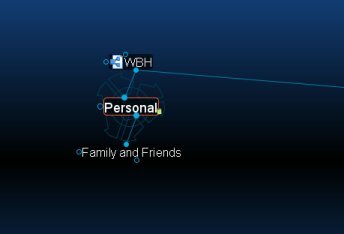 Under my main thought "WBH", I have two children, "Business" and "Personal" Under personal, there WERE a bunch of children. The child "Mental Health" was a child of both "WBH" and "Personal", so I un-linked the thought "Mental Health" from WBH buy highlighting it, right clicking and selecting unlink. 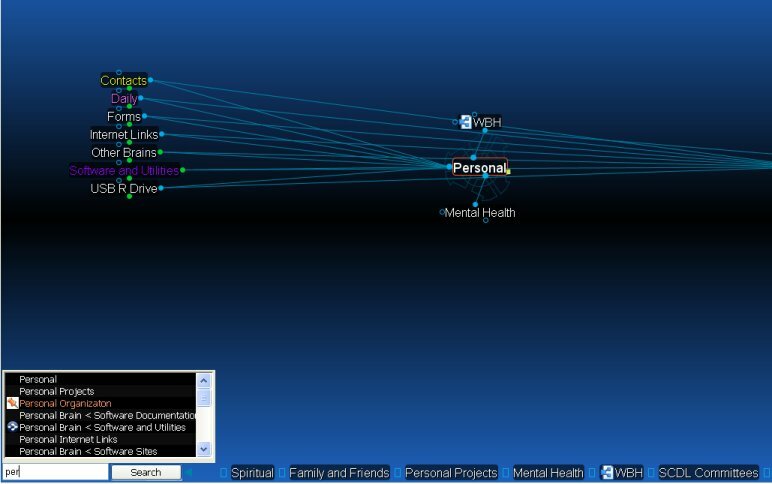 When I did that....all of my other children under "Personal" disappeared, except the "Mental Health" child. (See Image 1). So I did a search on "Personal Projects" which had been a child of "Personal". (See image 2). When I selected "Personal Projects" from the list, it magically re-appeared as a child of "Personal". I didn't do anything other than select it from the search list. (See image3). I then started searching on the other thoughts that I could remember as having been children of "personal" and low and behold, the ones that I could remember are there, and each time I select them from the search list, they come back and re-linked to "Personal". (See image 4 where I did a search on "financial", selected it, and it came back). This kind of "data loss" is simply unaccepable. How many other "children" of thoughts are missing from my plex? How do I find them? How can I have any confidence that I'm seeing all of the data I've put in the plex? I've totally lost confidence in this program to store my data and accurately present it to me. It really makes me wonder, when I have a plex up on the screen, if everything is actually there. When a plex gets large, there's no way to know if something is missing or lost. If I could remember the whole plex, I wouldn't need the program. I've been back and forth on this program.....it's been a love / hate relationship. I really like the concept and would love to love it. But I simply have no confidence in the program at this point. A similar thing happened to me two days ago. I was in outline view. When I unlinked a jump thought from a "popular" active thought -- where popular means several jumps, several parents, several children -- all of the other links just vanished! But when I can back to that now apparently orphaned thought a few minutes later, all the links were back. It was very disconcerting. 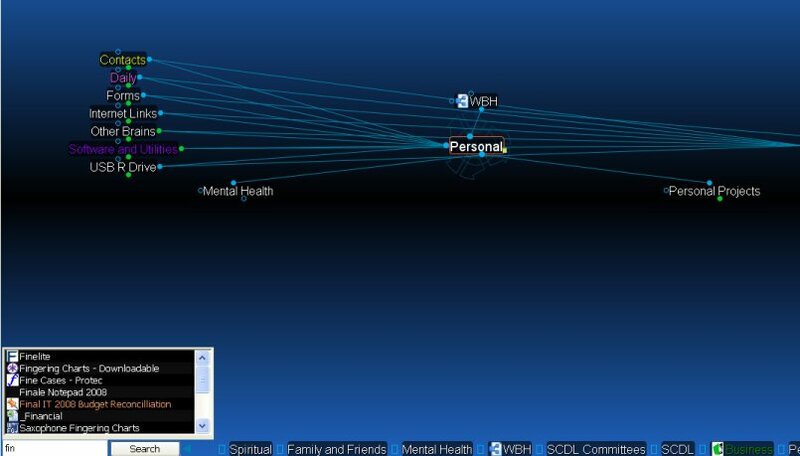 I continue to use and rely on PersonalBrain for my GTD'ness, but I am vary. I backup often -- very often. Thanks for the confirmation of the problem. I understand about backing up.....I do that constantly, also. But I simply don't have any confidence that my "backups" are actually showing me all the data. I've had a lot of instances where I go back to a thought and think to myself "wow, I thought I put "(insert whatever child thought it might have been)" in here and it's not here. I used to think I was going crazy (still may be , but that's a seperate issue). I now believe that I did put these things in, and they're simply not showing. So I've lost all confidence at this point. If you are comfortable with it you may also think about sending them the brain to recreate. The first thing to check is your Thought filter. There is a button at the top of the Brain that allows you to show only thoughts that have been activated in the past X amount of days. 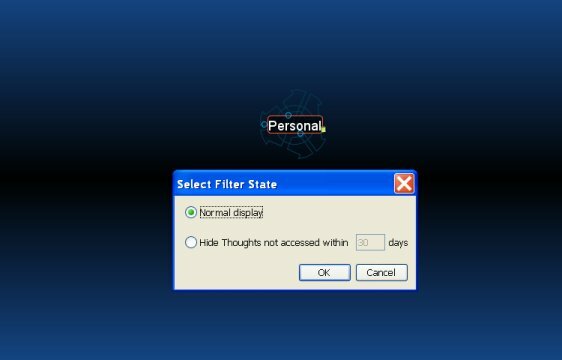 Try clicking it to turn OFF the Thought filter and see if all of your thoughts return to the plex. Hi Everyone, Thanks for the input. 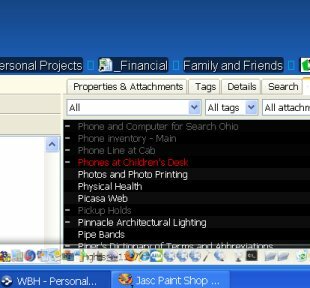 I'm using PB 5.0.2.5 pro, fully licensed running under XP Pro SP3. So I don't believe there's anything limiting functionality from a licensing standpoint. This morning, when loading PB, I immediately checked the filter and it was not on. So that can't be the problem. (See Image 10). The interesting thing is that... all of the children that I was able to bring back yesterday, are once again gone (See image 11. I can bring them back again, using the same process that I described previously, but they were gone upon first start of the brain this morning.) 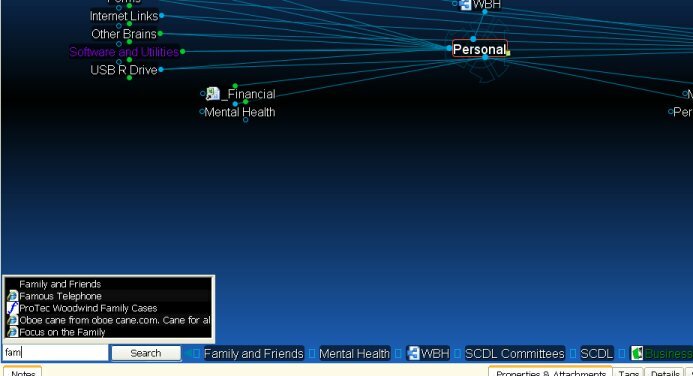 The last screen shot shows that the info is still there, I was able to bring back the "family and friends" child. dyslucksia, I read your comment about "deleting" thoughts, but this problem was not caused by deleting a thought, but instead by "unlinking" a thought from a parent. That though was also linked to another parent, so it wasn't like the unlinking left it orphaned. In fact, it wasn't the child that I unlinked that had the problem, it was all the other children that were linked to the same parent. So the "lost information" wasn't even thoughts that I was currently operating on. Also, my thoughts are various colors due to display and type settings. 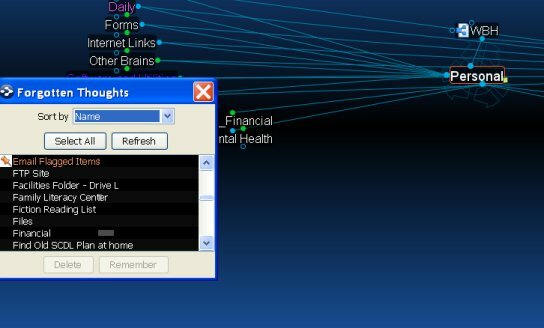 None of the thoughts that are on the screen are "forgotten" thoughts. I'm going to poke around a bit more and look at some of the filtering, backing up, copying and re-building and such like.......... but, all of that is more a curosity than anything else. From my perspective, the program is simply non-functional. I can't trust it, I have absolutly no confidence in it at all. And I'm wasting so much time "developing" this program for the PB people, that it's just not worth it anymore. If it ever matures, I may take another look at it. And I'll continue to watch what goes on here.....but with the kinds of problems I've had, and the kinds of problems I see others having, I find it difficult to understand how any of these releases can be called anything but alphas, or MAYBE betas. 1. Saved existing brain as a brainzip. 2. Turned filter "on" then back "off" in an attempt to reset the filter. 5. Turned filter "on" then back "off" in an attempt to reset the filter. None of that had any effect. So, I looked for a child thought that I knew had disappeared in this process. The child "Physical Health" had been a child of "Personal". See Image 21 - Physical Health is not on the Orphan Thoughts List. See Image 22 - Physical Health is not on the Parentless Thoughts List. 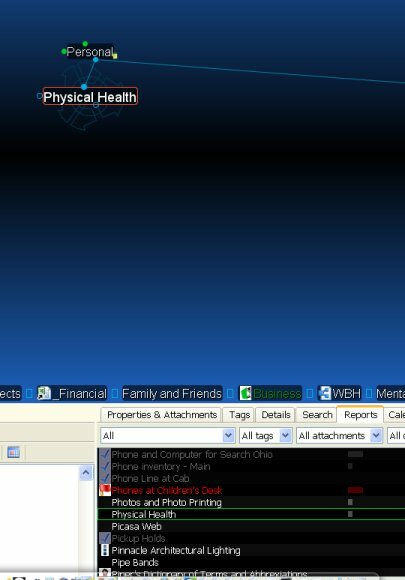 See Image 23 - Physical Health IS on the All Thoughts list and (See Image 24) when selected from that list, it magically-reappears in the plex. I guess, at this point, I have to go through all 1200 thoughts on the All Thoughts list and see if they are currently appearing in the plex. That should take, what, weeks?????? If you use the All Thoughts in Report, you can scroll through all thoughs with the down arrow key. Then if you use 1 second per thought, it will take you 1200 seconds. Bryan, I am very sorry for the problems you are experiencing. Is it possible to send us a Brainzip of your Brain as well as a copy of your output.log file and I can have our engineers take a closer look into why this is happening. You can email it to support@thebrain.com and reference this post. Moe, I'm sending a copy of the output.log file that was saved immediately after the problem occured. I'm sorry, but I can't send the brain. Since it has a lot of my "work" stuff in it, including personnel information and such, I can't send it due to confidentiality issues. I am willing to test anything that you all would like me to test, and send output.log files after that testing, if that helps. Thanks we received it and were looking into your issue. I also lost some URLs and a few attachments, as I related in this thread: http://forums.thebrain.com/tool/post/thebrain/vpost?id=3224047 However, mine happened after an update. Unfortunately, I don't remember any details of note, and I can't replicate the loss. In that thread, Harlan responded that a future version will be able to export contents of notes and attachments. This would alleviate most of my concerns of data loss. 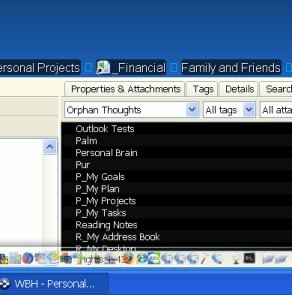 An additional improvement addressing the possibility that the brain.zip backup might be "abridged", would be a text file listing the number of thoughts, the number of thoughts with notes, the thought names, number of tags, details of types (HSB value), and the number of URLs and attachments. The text file would make it easier to check and determine the scope of any unexpected disparities between the backup and the current copy. Obviously many brains have thousands of thoughts, and no one is going to check for an exact match minus the activity since last backup. But it could give confidence in the integrity of the backup, help point out a major change, and then if one is found, it would define the extent of loss and speed up repair. I would particularly like to be able to make such a comparison between my current copy and a backup after a crash or after the first use of a beta. No doubt, this must be a frustrating problem for the programmers to deal with. It is critical and no one can give steps to replicating it. But still, I've been pretty impressed with how they've handled some other similar issues (potential data loss) recently, and I hope this is resolved with you recovering all thoughts, notes and attachments. Can you run a "All Thoughts" report, then select "Edit\Add Report to Selection", and then... well, I don't know. I suppose you could copy the thoughts and paste them into a new temp brain. That should at least let you compare the areas you are worried about, right? The "lost" thoughts should show up in their proper place at least the new temp copy, right? (Well, it's just a wild theory of mine, as I haven't been able to replicate your problem at this time.) But if you have a very large brain, I don't know if it would work for you. I certainly understand why you are upset. Losing data due to bad link behavior is very bad. I've learned to WAIT after any 1 operation until the plex is done with whatever it is going to do or the FOLLOWING operations I want to do will be lost. Makes me unhappy to have this in PB at this time. I can't see this bad behavior being allowed to stay. Seems like PB needs to be able to turn out a report of "corrupted connection information" or "problem" thoughts. But I suppose we have to help the development team figure out what these bad data states are in the first place, so they can be found. What could cause a thought that SHOULD be connected (via child gate, for instance) not show up in PB's query for what thoughts connect to the current/active thought? This seems to be the issue, as clicking on the CHILD thought, however you get there, causes PB to realize that it is a child of the other thought, and make the appropriate display. 1. Going through and "touching" every thought on the all thoughts list. This brought some of the thoughts back temporarily, but not all of them. 2. Exporting using "personal brain XML" and re-importing into an empty database. This did absolutly nothing. 3. Pinning thoughts and unpinning them. Even the things that seemed to work the other day, such as searching on the thoughts and selecting them did not bring back the thoughts permanently. They are gone again. At this point I'm completely dead in the water and am examining my options. 4 lost links in 5 minutes. This is a serious problem. I hope it is truly fixed in 5.1.